On leash dog obedience training, the first step to a well-mannered dog and reliable performance. Below please find our available on leash dog obedience options. Is it time for your dog to walk politely beside you on a leash? This is the main focus of our Basic Dog Obedience Training. The training consists of 14 days in-home dog training. Your dog will stay in the dog trainer’s home and learn to walk on a loose leash, sit on command, and sit automatically in the heel position when the handler stops walking, to lie down on command and to remain in this position until released. 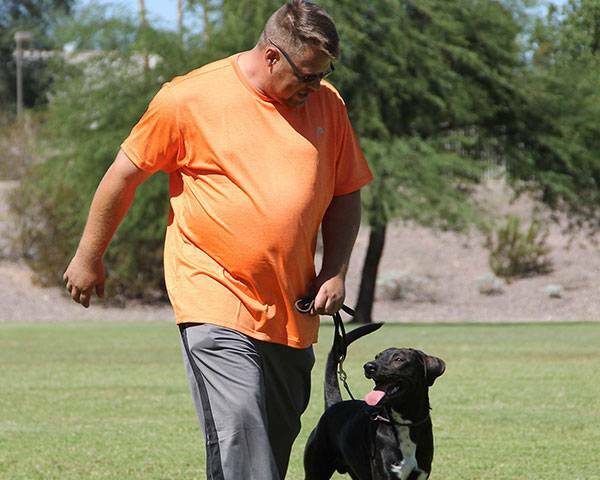 This program includes one private handler lesson and a follow up group class. This program consists of a 21 day long stay at the dog trainer’s home and includes heeling on a loose leash, sit on command and an automatic sit at heel when you stop walking, to lie down when told and to remain in the down position until released. Most important, this dog training level includes the off leash recall without distraction. The program includes one private handler lesson and a follow up group class.